The SCCF Pine Island Sound Eastern Indigo Snake Project (SPISEISP) was established in 2012 to research and help sustain the last known viable populations of eastern indigo snakes (Drymarchon couperi) on barrier islands in Florida. Eastern indigo snakes were known from many islands in Florida but have disappeared due to development, roads, and other factors. The only known reproducing populations of these rare and docile animals on islands in Florida are found in Pine Island Sound off the coast of Fort Myers, FL. This species has been protected in Florida since 1971 and by the U.S. Fish & Wildlife Service since 1978 and are in dire need of conservation efforts. The Sanibel-Captiva Conservation Foundation a 501(c)(3), not-for-profit organization, is committed to the conservation of eastern indigo snakes. The cost of adopting an eastern indigo snake is $75 (a tax-free deduction of $58 with a t-shirt, or $75 without one). By adopting an eastern indigo snake, you will be assisting our project by helping with the cost of pit-tags (microchips) and scanners, signage on the islands, fuels costs for boat travel to the islands, as well as various materials and equipment needed in our indigo snake field kits that are kept on each island in Pine Island Sound. The materials and tools included in these field kits are a scale, measuring tape, vials for genetic samples, sexing probes, forceps, tweezers, alcohol wipes, pit-tags, pamphlets to be handed out to the public and program t-shirts to increase awareness of the project. 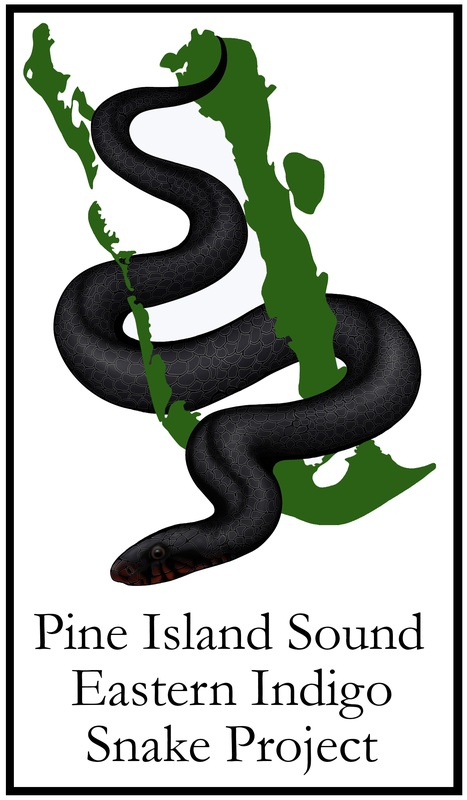 You will receive an eastern indigo snake t-shirt and project pamphlet with every adoption plus will be part of this much needed effort to sustain these magnificent reptiles in Pine Island Sound. If a gift, please include recipients name and address on first page of the form. More information on the program can be found by clicking here.